@jimmyfallon: Ok. @NKOTB fans... Follow me. On Sunday 6pm (est), I'll ask 3 questions. First 3 to @ me w/answers wins 2 tix. @jimmyfallon: Transportation and hotel not included. Must be at least 17 to win. Let's do this! 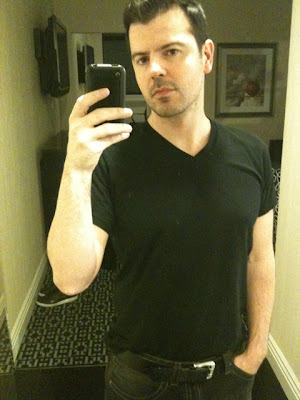 You can buy tickets at http://www.broadwayimpact.com/cabaret/ today and tomorrow using the code CABARET10. Friday they will be on sale without the code. The guys will be on the Today Show on Friday and Jimmy Fallon next Monday! There has been a second Radio City Music Hall show added: Saturday, June 19th. TOP CITY per capita - with the largest percentage of their the population DEMANDING NKOTB……….. WHEELING, WEST VIRGINIA! 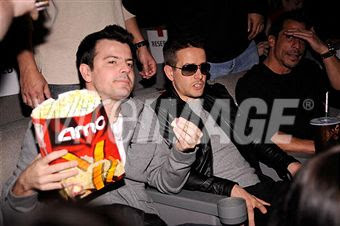 Following each screening, NKOTB will conduct a short question and answer session about the DVD! There will be surprises and prizes! We are excited to come to your city, thank you for inviting -ahem- DEMANDING us! 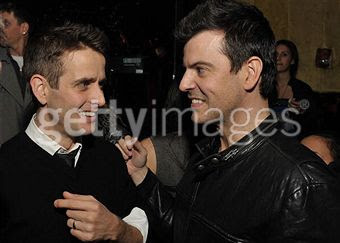 There are some photos of Joey and Jordan at Joey's concert and after party on Getty Images here. Check out more videos on cuttersftbll's youtube channel. Also check out these channels: rebeccaboo, KatexxHollywood, GabBRo, & misstratra. Some of Donnie's Back Rub episodes can be found here (thanks to returnofnkotb.com for link). In case you missed it, details about the American Express VIP giveway are here. NEW YORK, January 15, 2010 -- On Tuesday, January 19th, 2010 American Express will randomly select two lucky winners from contest tweets received to each win a pair of front row tickets to the NKOTB concert on Friday, June 18th, 2010 in New York City at Radio City Music Hall and to meet NKOTB. RT @AmericanExpress Once in a lifetime! 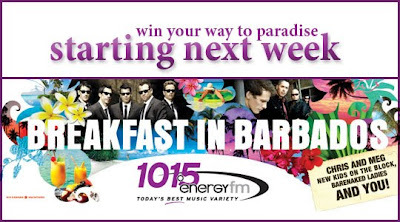 VIP package giveaway for 2 fans: FRONT ROW seats, pre-party access, MEET NKOTB! Entry details tmrw! ... 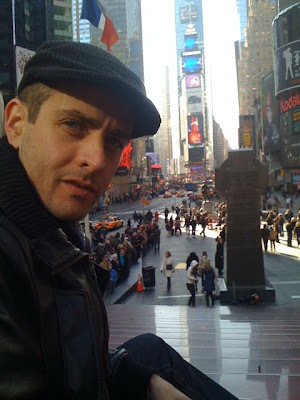 Speaking of, from The Beat's website: Joey McIntyre is taking over The Beat next Tuesday afternoon! Sign up to be one of Joe Mac's personal interns. Get him coffee, massage his feet, answer his phones AND grab some VIP tickets to his concert that night at the Magic Bag! Go here to sign up. Newbury Comics special: Order Coming Home DVD & get a limited autographed Postcard w/ purchase! Thanks to Chuck for the link. After 15 years, the New Kids On The Block made a triumphant return to the world's stage. Coming Home, the DVD, will document the process and the many journeys the band went on as they toured the globe playing over 140 sold-out arena concerts, and performing to a million plus fans. In addition, the DVD will feature six live performances from the band's world tour, an assortment of bloopers, behind-the-scenes, band jokes and special moments with the fans. NKOTB will be appearing at at Radio City Music Hall on June 18. Tickets are on sale 1/30 11AM and there will be an AMEX pre-sale on 1/22. 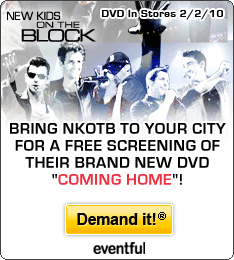 Bring NKOTB to Your City for Screening of "Coming Home"
DEMAND US! Happy New Year to all of our fans world wide! We hope you had a wonderful holiday season and we are excited for what’s ahead in 2010! To kick the New Year off with a bang, and in celebration of our new DVD “COMING HOME”, we want to give YOUR city a chance to win an exclusive screening of our DVD, with all of us of course! 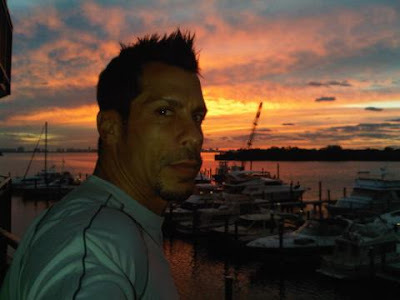 *DEMAND NKOTB in your city NOW by visiting eventful.com/nkotb or nkotb.com. Top U.S. Cities win! NKOTB will hold a Question and Answer session following the screening! Competition ends: Thursday, January 21, 2010 at 2pm PST. Winning cities will be announced Friday, January 22nd 2010! *Only U.S. Cities will be eligible. Get ready New Kids On The Block fans! Everyone’s favorite boy banders may be coming to a city near you! As part of their new DVD — Coming Home — launch, Joey McIntyre, Donnie Wahlberg, Danny Wood, Jordan Knight and Jonathan Knight have teamed up with Eventful, Inc. using the Demand It! service, allowing fans to demand NKOTB to come to their city. The top three cities with the most demands will win the NKOTB experience in their home city! NKOTB made a comeback after 15 years on hiatus. Coming Home takes fans along their comeback journey as they traveled the globe performing in over 140 sold-out concerts.